Ada soalan mengenai Apartosuites Jardines de Sabatini? Suite-suite rekabentuk ini terletak bertentangan dengan Royal Palace di Madrid. Suite-suite ini dilengkapi dengan Wifi percuma, TV satelit skrin rata serta dapur kecil yand serba lengkap. Apartosuites Jardines de Sabatini mempunyai teres matahari dengan pemandangan hebat Madrid. Setiap studio dan suite di Jardines de Sabatini mempunyai hiasan moden yang elegan. Dapur kecil yang bergaya dilengkapi dengan hob seramik, peti sejuk dan microwave. Para tetamu boleh menikmati bufet sarapan yang pelbagai di dalam bilik makan yang terang di Apartosuite. Terdapat juga kaunter penyambut tetamu yang dibuka 24 jam dengan meja tempahan lawatan. Apartosuites Jardines de Sabatini terletak betul-betul di hadapan Taman Sabatini, di pusat bandar Madrid. Plaza de España Square serta Gran Via Avenue berada dalam jarak 5 minit berjalan kaki. Stesen Principe Pio terletak dalam jarak 400 meter. Guests must note that it is necessary to contact the property in advance about expected arrival time. Polisi-polisi berbeza dan bayaran tambahan boleh dikenakan apabila menempah lebih daripada 3 bilik. Sila beritahu Apartosuites Jardines de Sabatini terlebih dahulu mengenai anggaran waktu ketibaan anda. Anda boleh melakukan ini dengan menggunakan kotak Permintaan Khas semasa membuat tempahan. Anda juga boleh menghubungi tempat penginapan dengan maklumat hubungan yang telah tertera di pengesahan anda. Anda mesti menunjukkan kad pengenalan bergambar serta kad kredit semasa mendaftar masuk. Harap maklum bahawa semua Permintaan Khas adalah tertakluk kepada ketersediaan dan bayaran tambahan mungkin dikenakan. Gave me a free upgrade to suite . Located very near to the junction where you can just walk to visit temple of Boden, parks, Madrid Palace, etc. So I was able to be staying comfortable during the stay. We stayed here over the New Year holiday and it was fantastic! The staff was exceptionally helpful and went above and beyond the call of duty as they tried to find restaurants that were open on New Year's eve as well as New Year's day. The location was amazing as it was within a 5 minute walk from the palace and 7 minute walk from the main strip. I would definitely recommend this hotel - great value for money! The location is excellent, 5 minutes' walk to the Royal Palace or Metro stations. The room is such comfortable with a nice view facing the Palace. All staff are helpful and friendly. We must stay here again for the next visit! The hotel is unique amd true to its name bejng an apartosuitea. The rooms are very big for european standard. It really is like an studio apartment. The staff isnvery friendly and super helpful. They really go beyond their duties to help you. Location, the room, value for money. Unfortunately only stayed over one night on my way driving to Gibraltar. Madrid is a tremendous lively place. The hotel is well placed and close to shops, restaurants and places of interest. Nice to have a kitchen facility but I didn't use it. Mix up at reception, I had ordered a twin room (travelling with my brother) but was given a double, it took a bit of time to be given a twin after some effort from me. Confusion re the parking, probably my fault but I had requested parking for one car. Only public parking available. Tried this new hotel based on recommendations and it did not disappoint. Location, price and service were top notch! Highly recommeded. The balcony views of the palace were awesome! The staff was nice and helpful! They upgraded us to a balcony suite!! Awesome stay. The only complaint was that they said my booking was for 1 person, and that it was 25€ (~$33) extra per day for a second person. My fault if I missed this on the reservation, but the price difference seemed like a lot. Thankfully, at checkout they removed one day of this charge too. Great experience. Great place I'd stay again. I wish I stayed much longer at this place but I did not have enough time since I was only in Madrid overnight. Location of this hotel apartment was prime and I would go back and stay at the same place on my next visit to Madrid. It was walking distance to a lot of place like the palace. View from the rooftop was magnificent. I also appreciate the front desk staff who was very accommodating and helpful. Hotel like new with very nice Breakfast. Big room with a kitchen and a nice terrace with excellent view over the castle. Friendly staff, large and good airconditioning rooms and near shopping areas. The Apartosuites Jardines de Sabatini is really an excellent choice when you are in Mardid. I will stay here again. The Apartosuite is surrounded by parks such as the Sabatini Gardens and has an excellent rooftop view of the Palacio Real in Madrid. Go in the evening for drinks to enjoy the view of the palace and chill out. The sun sets behind the hotel and thus is not as hot during summer. The lighting also provides an excellent opportunity to take beautiful pictures of the palace. The hotel is more of a service apartment with kitchen facilities if you're looking into doing some cooking with their local produce which can be obtained easily from several mini supermarkets in the vicinity. 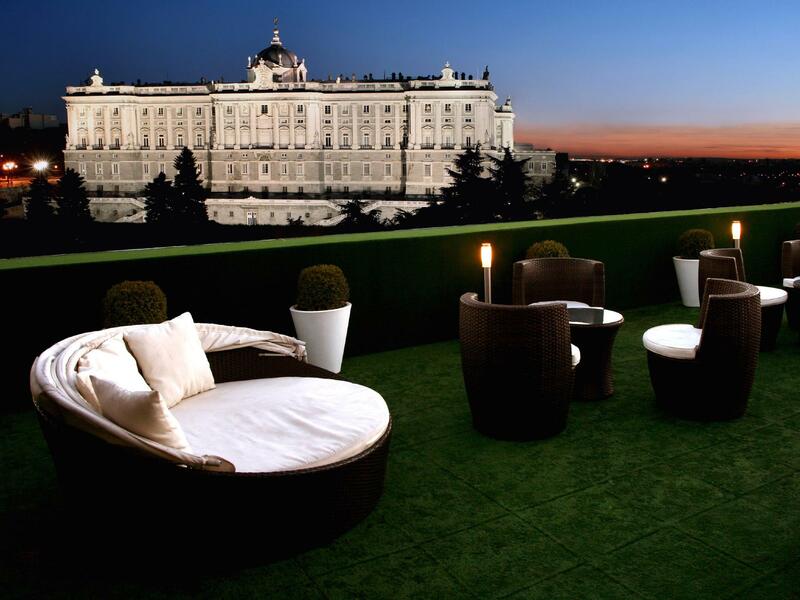 The hotel is within walking distance to Palacio Real and subsequently it is only a stone's throw away from the major plazas such as the Plaza Mayor as well as the pedestrian paths peppered with numerous cafes and shops that so define Madrid. Staff were attentive, they have a handover list within each shift, so they can follow up on any request.